- AJPW Real World Tag League '04 (November/December) = Nakajima & Kensuke Sasaki competed in the league, which was won by Taiyo Kea & Jamal. - AJPW The Unchained World (December 5, '04) = Nakajima, Akira Hokuto, Kensuke Sasaki, Genichiro Tenryu, & Kenshin won an "Elimination" Match over D-Lo Brown, Bull Buchanan, Jamal, Taiyo Kea, & TAKA Michinoku. - AJPW Junior Heavyweight Battle Royal '05 (January 3) = Nakajima won the Battle Royal. - AJPW Realize (February 16, '05) = Nakajima & Kaz Hayashi fell to Akira & Toshizo. - AJPW Korakuen Hall (April 10, '05) = Nakajima & Toshizo took down TAKA Michinoku & Blue K.
- AJPW All-Asian Tag Team Title Tournament (June '05) = Nakajima & Tomoaki Honma defeated Nobukazu Hirai & Akira Raijin and TAKA Michinoku & Psycho, before losing in the finals to Shuji Kondo & Brother Yasshi. - AJPW Heavy Fighting Yoyogi (June 26, '05) = Nakajima & Kensuke Sasaki won the AJPW All Asian Tag-Team Titles, beating Shuji Kondo & Brother Yasshi. - Dragon Gate Pro Wrestling Festival '05 (July 3) = Nakajima & Kensuke Sasaki defeated Magnum Tokyo & Genichiro Tenryu. - Wrestle-1 Sumo Hall (August 4, '05) = Nakajima & Tomoaki Honma fell to Terry Funk & Mil Mascaras. - Wrestle-1 Yoyogi National Stadium Gym (October 2, '05) = Nakajima & Dory Funk Jr were beaten by Abdullah the Butcher & Giant Kimala. - AJPW The Unchained World (November 19, '05) = Nakajima & Taiji Ishimori won over Kaz Hayashi & Space Lone Wolf. - AJPW Real World Tag League '05 (November/December) = Nakajima & Satoshi Kojima competed in the league, which was won by Team 3-D.
- AJPW Hold Out Tour Junior Heavyweight Tag Team League (January/February '06) = Nakajima & Taiji Ishimori competed in the league, which was won by Nosawa Rongai & Mazada. - AJPW Champion Carnival '06 (April) = Nakajima competed in the league, which was won by Taiyo Kea. - AJPW Junior Champion Carnival '06 (June/July) = Nakajima lost in the finals of the league to Kaz Hayashi. - AJPW Pro Wrestling Love in Ryogoku (August 27, '06) = Nakajima, Hiroshi Hase, & Satoshi Kojima defeated Suwama, Taru, & Brother Yasshi. - AJPW Real World Tag League '06 (November/December) = Nakajima & Kaz Hayashi competed in the league, which was won by Satoshi Kojima & Hiroyoshi Tenzan. - AJPW Pro Wrestling Love in Ryogoku Vol. 2 (February 17, '07) = Nakajima won the AJPW World Junior Heavyweight Title, beating Shuji Kondo. - AJPW Junior Champion Carnival '07 (June/July) = Nakajima competed in the league, which was won by Chris Sabin. - AJPW Pro Wrestling Love in Ryogoku Vol. 3 (August 26, '07) = Nakajima retained the AJPW World Junior Heavyweight Title, defeating Chris Sabin. - AJPW Pro Wrestling Love in Ryogoku Vol. 4 (March 1, '08) = Nakajima lost the AJPW World Junior Heavyweight Title to Silver King. - AJPW Junior Heavyweight Tag-Team League '08 (March) = Nakajima & Ryuji Hijikata won in the finals of the league over Kaz Hayashi & El Samurai. - NOAH GHC Tag-Team Titles League (March/April '08) = Nakajima & Kensuke Sasaki competed in the league, which was won by Akitoshi Saito & Bison Smith. - NOAH Budokan Hall (April 27, '08) = Nakajima & Kensuke Sasaki defeated Jun Akiyama & Takeshi Rikio. - Toryumon Mexico Dragon Mania III (May 11, '08) = Nakajima & Kento Miyahama took down Dr X & Nitro. - NOAH Budokan Hall (July 18, '08) = Nakajima, Kenta Kobashi, & Yoshihiro Takayama were beaten by Naomichi Marufuji, Mitsuharu Misawa, & Takashi Sugiura. - NOAH NTV Junior Heavyweight Tag-Team League '08 (August/September) = Nakajima & Kota Ibushi competed in the league, which was won by Taiji Ishimori & KENTA. - NOAH Budokan Hall (September 6, '08) = Nakajima & Kota Ibushi fell to the Briscoes. - RoH The Tokyo Summit (September 14, '08) = Nakajima & Naomichi Marufuji fought to a 35-Minute Draw with Kota Ibushi & KENTA. - RoH Glory By Honor VII (September 20, '08) = Nakajima lost to the NOAH GHC Junior Heavyweight Champion, Bryan Danielson. 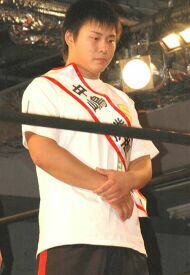 - NOAH The Tournament '08 (December) = Nakajima lost in the first round to Yoshinobu Kanemaru. Akitoshi Saito won the tournament. - RoH All-Star Extravaganza IV (December 26, '08) = Nakajima & Kensuke Sasaki defeated Brent Albright & Roderick Strong. - RoH Final Battle '08 (December 27) = Nakajima & Kensuke Sasaki were beaten by the Briscoes. - RoH Supercard of Honor IV (April 3, '09) = Nakajima fell to Roderick Strong. - RoH Take No Prisoners '09 (April 4) = Nakajima & Austin Aries were beaten by Tyler Black & KENTA. - RoH Aries vs. Richards (November 13, '09) = Nakajima lost a "Pick 6 Series" Match to Kenny Omega. - RoH The Omega Effect (November 14, '09) = Nakajima defeated El Generico.